A drunk driver runs a red light and is broad-sided by a car driven by an elderly couple. The College Station Fire Department arrives on the scene to discover the couple is trapped, and their car is leaking gallons of gasoline and antifreeze. We use the Jaws of Life to extract them, but the expensive life-saving equipment is severely damaged in the process. Several firefighters spend a number of hours at the scene cleaning up the hazardous fluids. Who should pay to repair the equipment and clean up the mess? A few months ago, it would have been paid with your tax money. Now, the irresponsible driver’s insurance company will get the bill. Imagine another scenario in which a house suddenly explodes. A neighbor sees the smoke and calls the fire department, which responds in minutes. The flames are quickly doused, but the house looks like it was hit dead center with a bomb. Investigators soon discover the fire was caused when a meth lab exploded. Police track down and arrest the perpetrators, but cleaning up the dangerous scene takes firefighters several hours. Again, who pays? Last year, it would have been you, the taxpayer. From now on, it will be the perpetrators whose illegal activity started the blaze, putting their neighbors and the responding firefighters in danger. When unfortunate incidents occur in our community, the fire department responds as quickly as possible to help those involved. However, a significant number of these accidents are caused by negligence, irresponsibility or even criminal behavior. These responses can be extremely expensive if they involve hazardous chemicals or the use of expensive equipment. In the past, our city’s taxpayers have been forced to pick up the entire tab. Most people are not keen on footing the bill for an accident someone else caused. But thanks to the Revenue Rescue Cost Recovery program, part of the financial burden will now be transferred from taxpayers to the at-fault parties. The recovered costs will directly benefit you by helping keep your taxes among the lowest in the state while maintaining a high level of service. The program also will allow needed funds to be shifted to training, public education and fire prevention. After unanimously approving the concept in November, the College Station City Council will consider approving the contract and rate schedule as part of its meeting on Thursday. Vehicle accidents that result in hazardous materials such as oil, fuel, coolant or other chemicals being spilled into the environment. The bill would pay for cleaning or replacing protective equipment that is contaminated or damaged beyond repair. 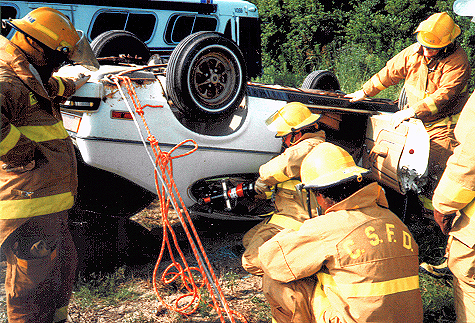 Vehicle accidents that require the use of specialized rescue equipment to free trapped occupants. This equipment includes hydraulic spreaders (Jaws of Life), cutters and rams. Criminal or negligent behavior that results in vehicle accidents or other incidents, including such things as arson, accidents caused by drunk drivers, etc. Most claims will be made directly to the at-fault individual’s insurance company, which provides coverage as part of its premiums. Higher insurance rates may result for the responsible party but it will be due to the accident they caused, not a small claim from the fire department. Unless criminal behavior caused the incident, the responsible party will not be directly billed. The amount will be based mostly on the actual costs of equipment and special materials. Of the roughly 7,000 calls the College Station Fire Department responded to in 2011, about 400 could have been billed through the cost recovery program. Based on that number, we can expect to recover more than $126,000 each year. Since the collector is paid only a percentage when it successfully collects a bill, the program costs the city nothing. We are piggy-backing onto an existing contract the City of Bryan has with Advanced Data Processing, Inc., a respected company used by many other communities across Texas, most notably Dallas. Brazos County volunteer fire departments also rely on it. Last year, Bryan recovered $82,373 from 316 claims during calendar year 2009, an average of more than $260 from each submission. We are dedicated to providing reliable, high-quality service at the lowest possible cost to our taxpayers. The Revenue Rescue Cost Recovery program is a responsible and proactive way to help us fulfill that mission. This entry was posted on March 6, 2012 by City of College Station. It was filed under Fire, Public Communications and was tagged with Fire, Revenue Rescue Cost Recovery. Will this additional revenue be used to reduce our tax rate? Or will the taxpayers foot new bills instead? The spin of this article is that the taxpayers shouldn’t foot the bill. How will the taxpayers actually benefit. Will the tax decrease be in the sales tax or the property tax? Reduced fees? Return the money, don’t spend it elsewhere. Thanks for your comments and questions, and for giving us the opportunity to clarify what this program is all about. First of all, it will apply only to certain incidents involving negligent or criminal behavior. Of the 7,000 calls the fire department responded to last year, this program would have applied to only 400 cases but would have generated about $126,000. For example, taxpayers have had to pick up the entire tab when a drunk driver caused an accident requiring specialized equipment or the cleanup of hazardous fluids. The cost of maintaining and replacing those materials is substantial. Under this program, the at-fault party is held accountable through their insurance company, most of which already provide such coverage. In other words, you no longer pay the price for someone else’s poor judgment. The best part is that the program costs the city and its taxpayers nothing. The collection company receives its fee only when it collects a bill. If an arsonist burns down a house, he will rightly be held responsible for the costs. That’s not spin, that’s reality. Your elected representatives on the city council have been unanimous in their support of this concept. One member, Jess Fields, voted against the plan last night because of an issue with the contract, not because he was against the concept itself. In these tough economic times, we have three options – raise taxes, reduce services or find additional revenue. We all want to avoid the first two options. The revenue from this program will help us maintain a high level of service without additional taxes, and with a new fire station opening later this year, that is extremely important. Finally, the city has responded to the tough economy by making substantial budget cuts in the last four years, not by raising taxes. In fact, the property tax rate – already among the lowest in the state — was actually reduced this year to its lowest point in a decade. Thank you again for submitting your questions and taking part in our city blogs!